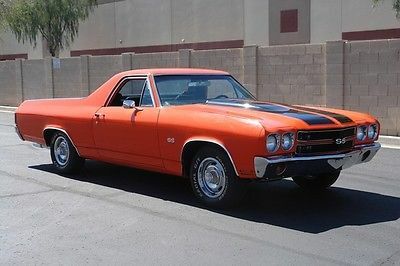 1970 Chevrolet El Camino -- 1970 Chevrolet EL Camino Factory A/C.. Rust Free Arizona Car..!! MAKE OFFER..!! 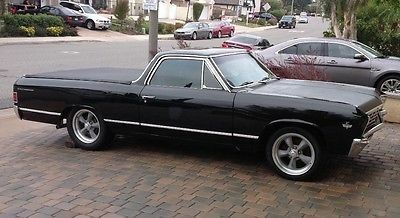 1966 Chevrolet El Camino This is a very nice 1966 El Camino. It has the perfect combo of black exterior and black bucket seat interior. A 327 motor with a 4-speed transmission. The car is extremely straight with a very good paint job. As you can see it is also rust free. 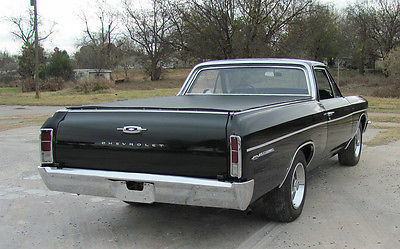 It is very rare to a 1966 El Camino set up like this one. This car will get lots of attention. Please contact me at 405-640-8077 for additional information or questions. Feel free to ask any questions prior to bidding- I will try to get back to you within 2 hours! We are selling this car because the owner passed away. 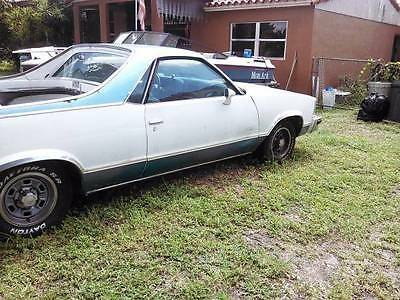 This is a very well maintained, garage kept Chevrolet El Camino 1980. He just drove it around town when he needed a "Pickup." This is the standard V6 engine model, with 62,010 original miles. I have driven this car around and it runs great! Would be a really fun project car--has "classic car" plates on it. Now the bad: I would consider the interior to be in just fair condition-- the dashboard in particular has quite a few cracks which I made sure to photograph, and there is a tear in the drivers side leather/vinyl headrest. There is some minor rusting on the driver's side door, which I also made sure to photograph, and the tailpipe is also pretty rusted. Also-because the owner got sick, this car was not driven very much in the last few years. It was still taken around town- but probably only a couple hundred miles. The last time it was at the mechanic it checked out fine-but it is worth mentioning. Regarding shipping: this item is located in Fort Collins, Colorado. Local Pick up is preferred. Please message me first if you are bidding from out of state. An immediate payment of $1,000 will need to be made at time of purchase. With the rest completed at time of in-person sale. 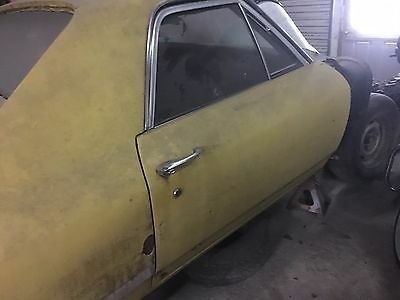 YOU ARE VIEWING A 1971 CHEVY SS ELCAMINO THAT HAS HAD A COMPLETE FRAME OFF RESTORATION WITH A NEW CAB FLOOR PAN. THE FRAME WAS SANDBLASTED AND PAINTED WITH POR 15. THE CAR HAS NEW UPHOLSTERED BUCKET SEATS,NEW CARPETING, NEW CHROME BUMPERS AND NEW VINYL TOP. THE CAR WAS REPAINTED ABOUT 10 YEARS AGO AND STILL LOOKS GOOD. THE INSIDE BED OF THE TRUCK IS RUST FREE AND HAS RECENT TEXTURED PAINT. THE CARS FRAME AND BODY ARE RUST FREE. THE CAR HAS A 402(396) BIG BLOCK PERIOD CORRECT MOTOR WITH ELDEBROCK PERFORMANCE 2.0 ALUMINUM INTAKE, HOLLY 4 BARREL SQUARE BORE 700 CFM CARBURETOR, TRUE DUAL EXHAUST. THE CAR WAS A ORIGINAL AC BUT IT HAS BEEN REMOVED. THE CAR IS IN EXCELLENT RUNNING CONDITION AND READY FOR THE NEW OWNER TO ENJOY. The car is located in Erie,Pa. I highly encourage you to ask any questions prior to bidding or for you to schedule a viewing to look at the car. Please have your wifes permission and all funds available prior to bidding. This 46 year old car has no warranty and is being sold in as-is condition. Please call Todd @ 814-450-0627 if you have questions or need additional photos. 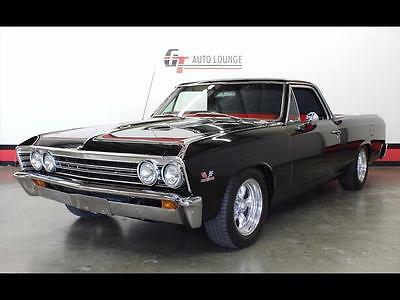 This is a rare L79 325HP 327 equipped '67 EL CAMINO. Factory A/C on the matching number 327. One head is original, the other is a 66 dated head. 99 % no rust body, straight and clean. 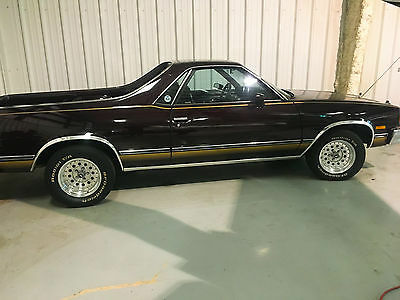 I purchased this car many years back from Red Bull and it has paint damage on the doors and tailgate from the stickers they had on it.This El Camino was originally white with a black interior. It has all its original sheetmetal except for the hood- I found a real clean original GM hood in original paint and all I did was prime it black to match the car.The El Camino has the original 12 bolt non-posi out back. This was originally a 4 Speed car as the engine code shows. I was told by a previous owner that sold the Camino to Red Bull the TH350 was put in it by an old guy that did a frame up restoration on it who could no longer drive a 4 speed car. Needs minor work to get it running again- a carb and ignition (plugs/points), cooling system flush, a battery and a few hoses would be nice. Has GM disc brakes up front and brakes should at least have cylinder rebuild kits done.I have never driven the car further than from a trailer to my driveway as it had fried points when I bought it and I intended to put a different engine in it and restore the L79 motor and just keep it on a stand.Moving later this year is the family plan, so the El Camino is listed here at a super low price. Sorry, NO offers will be accepted. 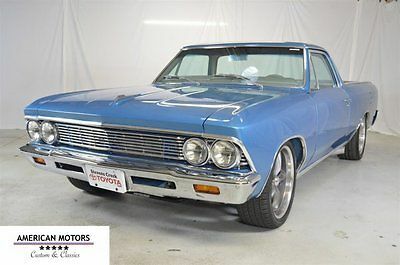 There were only around 10 to 15 or so '67 L79 El Camino's built and you will likely never again find ANY L79 '67 under 10k this nice.Deposit will not be refunded if your wife tells you you can't have it, so please DO NOT BID unless your finances are in order and you intend to follow through with the purchase.As written above, this EL CAMINO does NOT run and I am not going to get it running for the buyer. It is sold as is, where is and the buyer must arrange transportation in a timely manner. 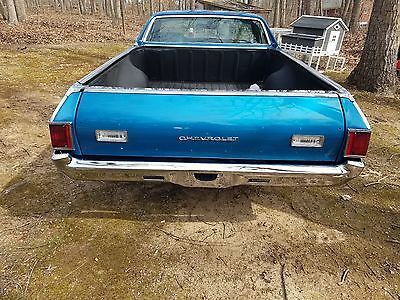 1985 Chevrolet El Camino - Stunning Upgraded Show Car 1985 Chevrolet El Camino - Stunning - Near Mint Condition! 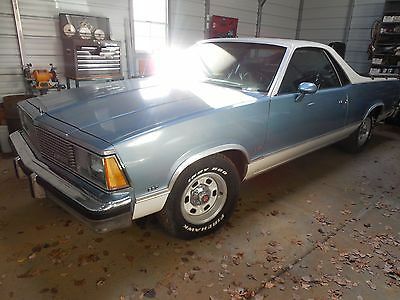 This is a stunning 1985 El Camino with exceptionally low miles. The previous owner entered it in shows in the midwest where it often won awards. This is a show car! You'll appreciate the immaculate attention to detail and amazing condition this vehicle is in. It runs great. It sparkles. It's loud. It's an awesome El Camino. 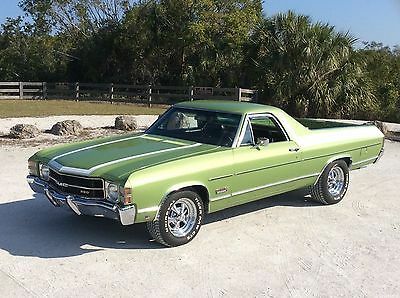 You won't find another El Camino on the market like this one. These are very rare in this condition. I believe I am the 3rd owner of this vehicle. I've owned it for about 2 years and just don't have the time to show it like I planned. Feel free to contact me directly at 770-605-8882. Cashiers checks only. Shipping can be arranged and will be at buyer's cost. Engine - 1972 350 4 Bolt Main Bored .30 OverCrankshaft - Forged Micro PolishConnecting Rods - ResizedPistons - Forged Flat Top 10.5:1 Moly RingsCamshaft - Edelbrook Torker II HydraulicTiming Chain - Cloyes True RollerPush Rods - High Energy Welded on TipsRocker Arms - Competition Cam Roller TipsOil Pump - Melling High VolumeOil Pan - Moroso 7 qts.Intake Manifold - Edelbrok Torker IICarburetor - Holley 750 Double PumperFuel Pump - HolleyFuel Regulator - HolleyDistributor - Mallory Comp. 9000Ignition Coil - Mallory Promaster M.S.D.Cylinder Heads - 1970 Camaro 2.02 Intake / 1.60 ExhaustTransmission - TH-400 with a B&M Shift Kit and 10 inch TCI ConverterRear End - 7.5 inch Posi Rear End and 3.42 GearOil Filter - Fram PH13Air Filter - Fram CA136Trans Oil - Type F Cam 2Motor Oil - 20-50 Pennzoil * Seller reserves the right to withdraw sale and terminate listing at any point. * This vehicle is being advertised locally and may be sold off eBay**All information is believed to be true and accurate at the time of this listing. Seller is not responsible for any discrepancies herein. 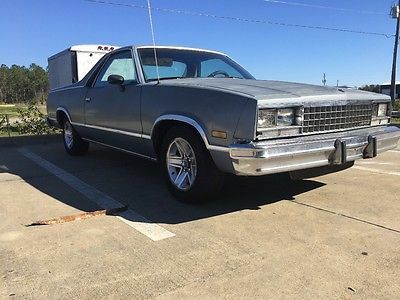 1984 El Camino with a turbo 305 runs strong 85,000 original miles. ICE COLD A/C, Radio, very very little rust. Bada** car that's ready to roll as an everyday driver. Will deliver anywhere in Florida is compensated for time and fuel AFTER CAR IS PAID FOR! 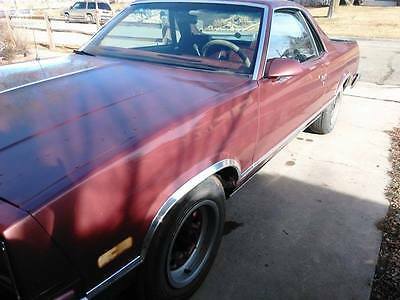 1987 Chevrolet El Camino Chrome 1987 Chevrolet El Camino Conquista / SS / 68K Miles. Runs Great. ALL ORIGINAL! 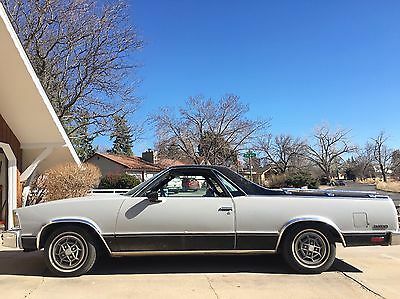 Im selling a 1987 Chevy El Camino. ALL ORIGINAL. 68,000 miles. Very very small and minor dent on rear but is easily fixable for cheap. Driver side interior door handle snapped but door still opens. Runs excellent. No collisions. Fluids have all been maintained as well as original condition of interior. Im asking 7500$ O.b.o. Im located in cortez colorado and i am planning on moving back around the chicagoland area around the 26th of march. if you have any further questions please contact me at 224-676-8669. - Jake.